1) First-off, can you give us an introduction to Slovak cuisine: what is special about it and what your favourite traditional dish is (and where you would eat it in Slovakia)? The best introduction to Slovak cuisine is through our national dish, and that’s Halušky s bryndzou or Halušky with Bryndza Cheese. Bryndza cheese is a truly Slovak invention whose origins and name are protected by the EU. As for the Halušky – it’s a special type of pasta (similar but by no means exactly the same as a dumpling) that can be easily made at home if you have the right equipment. Halušky have several variations and they feature in a number of other Slovak dishes. The best place to eat Halušky s bryndzou is at what we call in Slovak a Salaš. Salaš is a Slovak name for a shepherds’ house – a wooden cottage usually located close to the pastures. Quite a few also have an adjacent restaurant, where you can savour traditional Slovak food and enjoy the beauty of the Slovak countryside at the same time. My favourite salaš is one in Zázrivá, about 10km east of Terchová in the Malá Fatra region (www.salaszazriva.sk), where they prepare a wonderful selection of Slovak dishes from fresh, locally made ingredients. 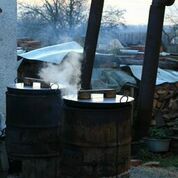 What’s special about the place is that you can see traditional Slovak cheeses being made on the premises, as well as watch sheep, goats, horses and other farm animals grazing the lush pastures around. For those with a sweet tooth like me, I would definitely recommend to try our strudels. The Detvian strudel I wrote about in my blog is something to die for. The family business based in a small village near Detva, in Central Slovakia near Banská Bystrica, is barely managing to keep up with the high demand. 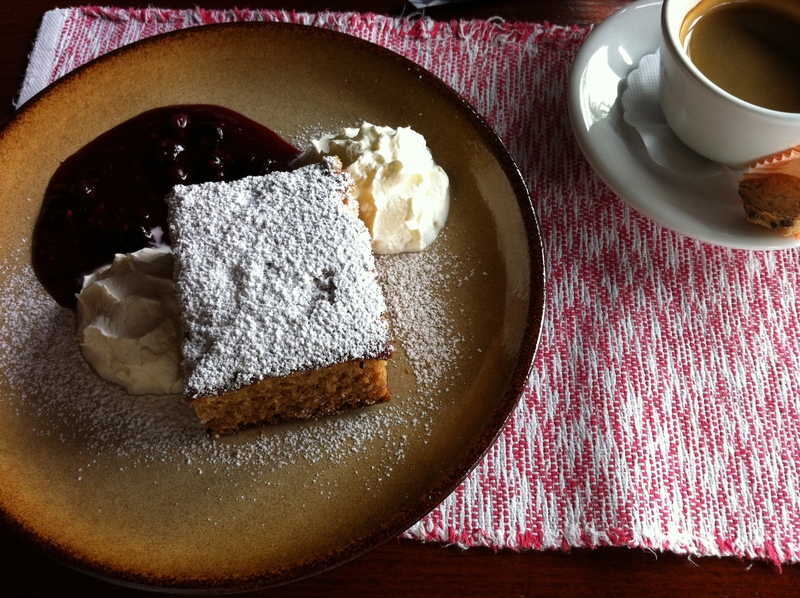 They deliver their delicious strudels to local deli shops, cafes and hotels around the Podpoľanie region. 2) What inspired you to write a book on Slovak cooking? My love of cooking and writing in English. When I got a huge Culinaria of Europe for Christmas more than ten years ago, I saw that Slovakia was given only a marginal mention – a couple of paragraphs about sheep’s milk cheese and Halušky. There were a few factual errors in the text, so I took it as a challenge and decided to write a book devoted entirely to Slovak cuisine. 3) People think of Slovak food as quite heavy. What are some ‘surprising’ dishes which do not fit into this category? Slovak food is only as heavy as you want to make or have it – it’s about the choice of ingredients, the amount of fat or sugar in the dish, the portion size, and perhaps the extras. That said, you can find quite a few nutritious and healthy Slovak dishes on some restaurant menus, but you can definitely control things when you make the meal yourself. I’m not a health freak but I do like simple, nourishing food and that affected the choice of recipes for ‘A Taste of Slovakia’. There’s a good balance of soups, mains, desserts, snacks and a whole chapter on preserving garden produce, which is what the Slovaks love to do in the summer, and are very good at. So contrary to popular belief, you’ll find dishes like Baked Buckwheat Kasha, Bryndza Cheese Sticks, Scrambled Eggs with Forest Mushrooms, or Hot Plums with Ice-cream and Mead in the book. 4) What is your advice for people who wish to travel to Slovakia to experience genuine, really good traditional Slovak food but don’t know how or where? Contact websites like yours or mine, get in touch with local people, be nice and respectful, and you’re very likely to make friends and be invited to their homes. We love having guests, sharing food and drink with our visitors, and make them feel at home. 5) What is it about your book that makes it interesting to readers in your opinion? ‘A Taste of Slovakia’ is much more than a collection of traditional Slovak recipes. It’s a journey into this small country’s culture (folk stories), the customs that evolve around cooking and eating (Celebrating summer harvest), the lifestyle (Goulash parties), as well as history of some typical ingredients (bryndza cheese, forest mushrooms, mead etc.). And for those who delve deeper into the text, there is an added bonus… but I’m not going to disclose more here – you need to buy the book for that! 6) Did you have to travel around Slovakia sourcing the best recipes for this book? Did you have any interesting experiences on the research? Before I even started writing, I’d read through that tome of European Culinaria to understand what makes our cuisine different from others, and what we could contribute to the European or world’s table. Then I got myself lots of Slovak books, ancient and more contemporary, and did a thorough research. But the most enjoyable part of the project was definitely travelling around Slovakia, meeting people, listening to their stories, collecting ideas, taking pictures and discovering hidden gems of our countryside. Originally, the plan was to write a single book that would map our eating habits throughout the four seasons of the Slovak year, but I soon realized there would be plenty of material to fill four books. And that’s how I took it on. The first book is about summer in a Slovak kitchen. Interesting experiences? There were quite a few, especially when I was taken for a reporter or a professional photographer on a number of occasions, which sometimes won me a prominent place in the queue or opened the doors that were normally shut for the public. Nobody found out I was a self-taught photographer learning on the way and experimenting, often in one-time situations. Fortunately, most of the photos came out well, though I have to say I have raised my standards and become much more finicky on the way. 7) Where can people buy your book? Through my website www.cookslovak.com, my e-mail address cookslovak@gmail.com, or in one of the bookshops in Slovakia. At the moment, A Taste of Slovakia is selling at Artforum Bookshop in Zilina and Bratislava, Oxford Bookshop at Laurinska 9, Bratislava and some other venues like Bratislava Flagship Restaurant, Vcelco Smolenice s.r.o., and Podpolianske muzeum Detva. I’m about to strike a selling contract with Halusky shop in London. I’m also actively looking for reliable partners to help me sell the book in the USA, Canada and Australia where there is quite a large Slovak diaspora, though I believe A Taste of Slovakia could make a good read for anyone interested in food. Bryndza, the tart, tangy sheep’s cheese that forms one of the backbones of Slovak cuisine, can be used in a variety of dishes – most famously, of course, in the national dish Bryndzové Halušky (potato dumplings with sheep’s cheese, to be featured in another post, because actually getting those dumplings right is an art many non-Slovaks can’t grasp). But just about the easiest thing to do with bryndza other than eat it straight is to make it into a tasty spread (natierka) which could also be used as a dip – perfect for a dinner party extra whether you’re in Slovakia or out of it. 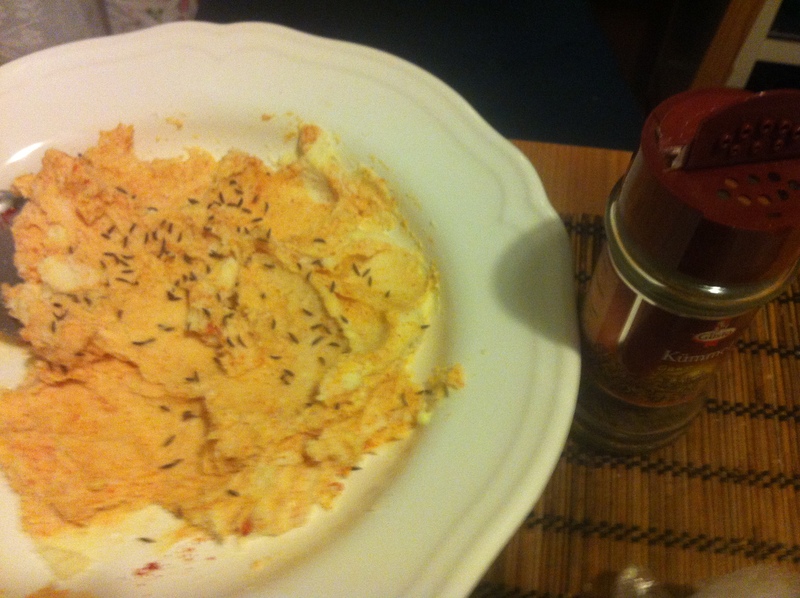 – Powdered sweet red pepper (this is used more for colour than for taste. You could also use paprika for this, which will be the nearest widely-available thing in the UK – but then it would be more feisty). 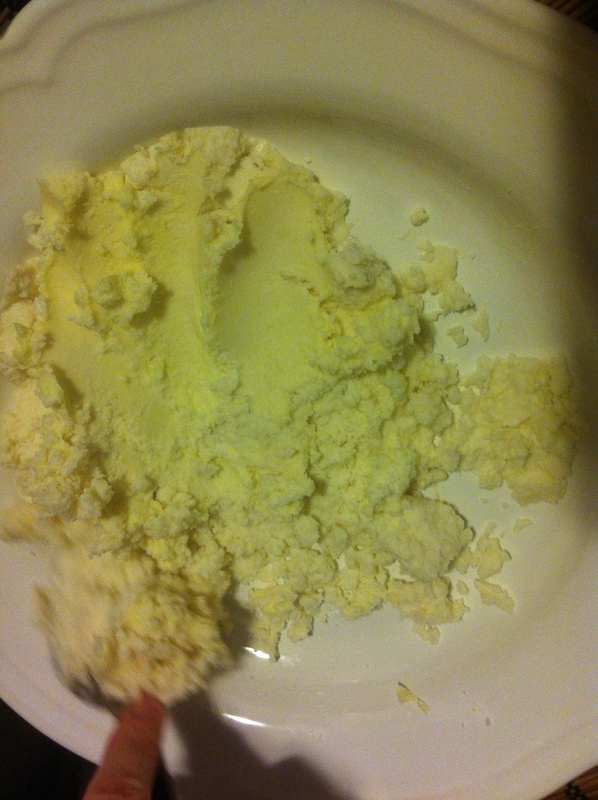 2: Cream in the pre-softened butter, having cut the butter into small knobs. Cream until the mixture has a smooth consistency. 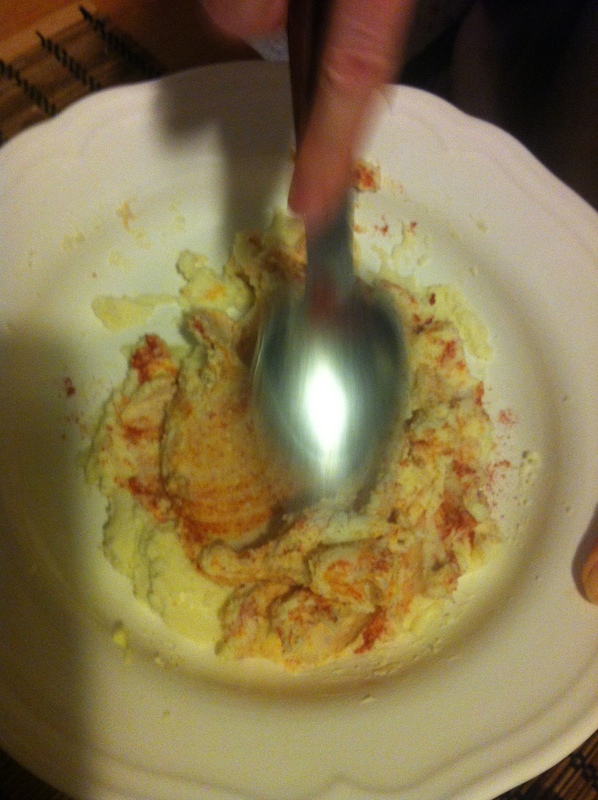 3: Thoroughly mix in the sweet red pepper powder or paprika, as in the pic below. Note how the colour slowly changes to a vibrant salmon pink. 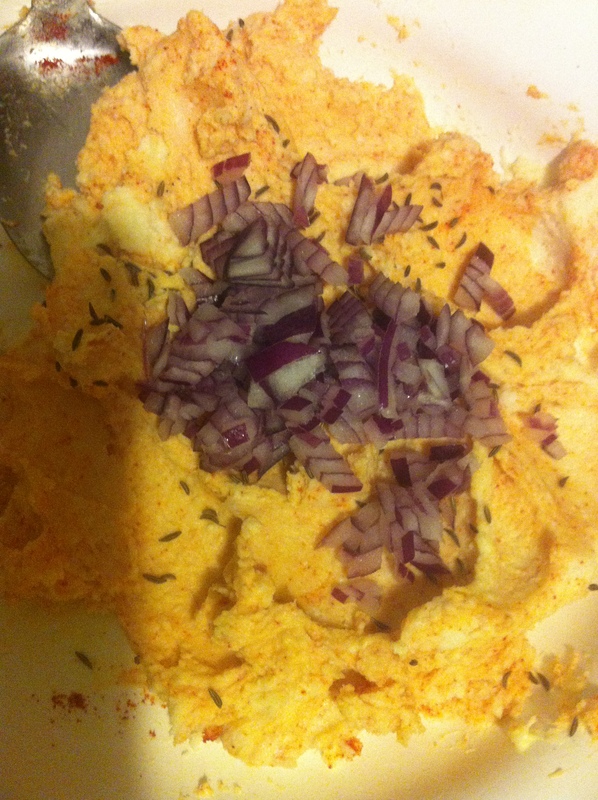 5: Mix in about half a finely chopped red onion. Chop it really fine: it improves the taste. Imagine it: the biting wind of a mid-winter afternoon, the dismalness of night-time already looming although there has barely been any daylight to speak of. Still, you’ve made the best of it and hiked into the hills, only to find the weather has got too much for you. It’s gnawed its way into the marrow of your bones. The only thought that keeps flashing around your brain is not how beautiful the landscape is (although, in its own bleak way, it does have a beauty) but how to get warm, and that quickly. As extensions of that thought are the dual fantasies of hot food and hot drink, ideally in somewhere atmospheric although you’d settle for less, you’d settle for anything with four walls and a roof – and at the same time you’re entertaining this fantasy you know that you’re in the countryside and any kind of shelter is a long shot. This was the context in which we rounded the brow of a bare hill and saw, in the dip below, Reštaurácia Furman for the first time. Furman is part of that delightful breed of places to eat in Slovakia that rears the meat that winds up on the plate in a wood out back. For fresh jeleň (venison) or bažant (pheasant) there are few better places in the country to come than here, as we soon discovered. The welcome is an unusual one. Strangely, the first thing you see is an immense yellow dog galloping around in a paddock of its own, as if it were a dangerous creature, but that should not deter you: the dog is deceptively friendly, and not on the menu. The deer in the field behind, however, are. Whilst first-timers to this type of restaurant might find it cruel that these sweet- and sombre-seeming animals should act, on the one hand, as a diversion outside the restaurant (to pet them, to pose for pictures with them, etc) and yet should be served up as the speciality of the day inside, I personally find it refreshing: the animals have an entire wood of their own to roam in, and you can be sure the meat here is fresh, and the animals well-cared for during their lives. A beast-to-meat relationship, vividly there for all to see, is an honest one – one no meat-eater should shy away from. Once we’d peeled off our layers, got our blood circulating again and settled down at a table in an interior somehow combining traditional Slovak with just a touch of the Wild West, the obvious choice (from the dishes of the day, which I always go for) was either the deer goulash or the pheasant in red wine sauce and it was the latter that I went for. 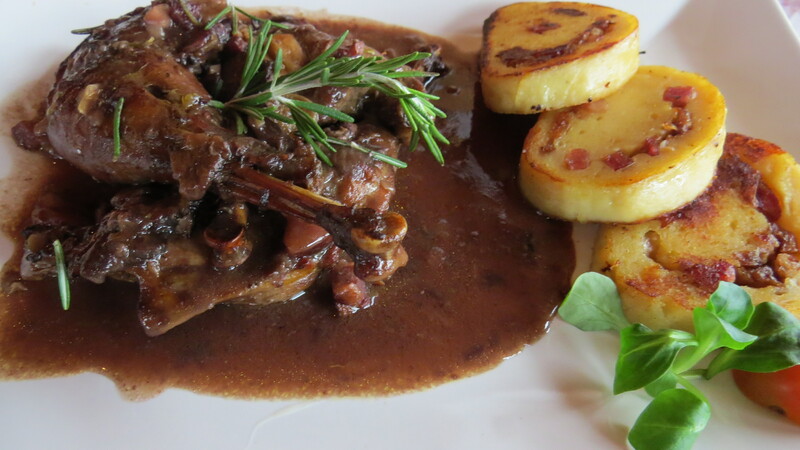 It came deliciously and richly seasoned with herbs, and accompanied with potato croquettes that rank up there with the very best I’ve had in Slovakia – again impeccably seasoned with rosemary and thyme and ladled with cranberries on top. Washing it down was the mulled wine my chilled body craved (served sour, in the typical Slovak way, with honey and sugar provided). My dining companion ordered grilled oštiepok, and they were very accommodating in making it gluten-free. Several other styles of venison (as ragout with dates, or a leg cut with a sauce concocted from forest mushrooms) were also available. Prices were invariably between 5 and 9 Euros for main courses. What you are getting with Reštaurácia Furman is a gloriously typical Slovak eatery (the sheepskins are draped over the chunky wooden seats, the stag’s heads gaze haughtily down from their fixtures on the walls, the ceiling is studded with old cart wheels) proud of its tradition – but not once compromising on either quality of food or ambience. This is how a typical rural restaurant would have been (give or take) 60 or 70 years ago. Now their rustic wood hunter-friendly decor and self-reared meat reared is something that should be highly prized, because it is actually increasingly rare. 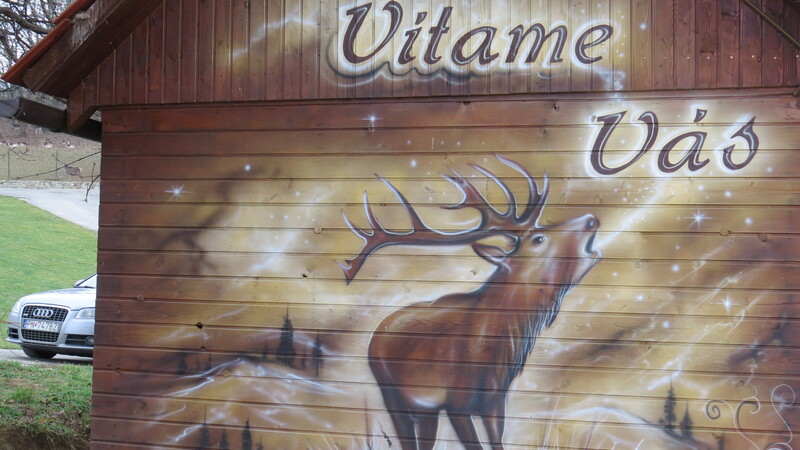 Sorry, vegetarians, or members of anti-hunting sects: this is how a quintessential Slovak restaurant should be. If you don’t like it, there are plenty of other more modern joints in bigger towns and cities. But if you came to Slovakia expecting an eatery exuding raw, rural Slovak-ness (as you would be entitled to do) then voila: this is it. It is the sort of spot that, on any walking holiday, you would dream of chancing upon. After all, it has an enviable location – a few kilometres’ walk above Piešt’any and right on the cusp of the woodsy hills that form an arm of the Small Carpathians, Povazsky Inovec, through which you can stroll through stunning upland countryside to Tematín Castle. Part of the panorama from the restaurant and the bar next door is across the summer terrace down over rolling farmland to the rather dramatic grey-white spread of Nádrž Slňava, one of the country’s biggest reservoirs. And just down the track too are the ruins of Villa Bacchus, where Beethoven once stayed whilst composing his Moonlight Sonata. But from the look of the clientele, it’s also a place well-heeled Piešt’any folks and those from further a-field would willingly venture up into them hills to sample. And a furman? It’ss an antiquated profession that would translate most closely in English to “Coachman”. But there is no real equivalent. A furman would have been a man who lived on a smallholding in the countryside, with a carriage that he would hire out for different purposes (taking goods to market, or ferrying paying passengers around from A to B.) 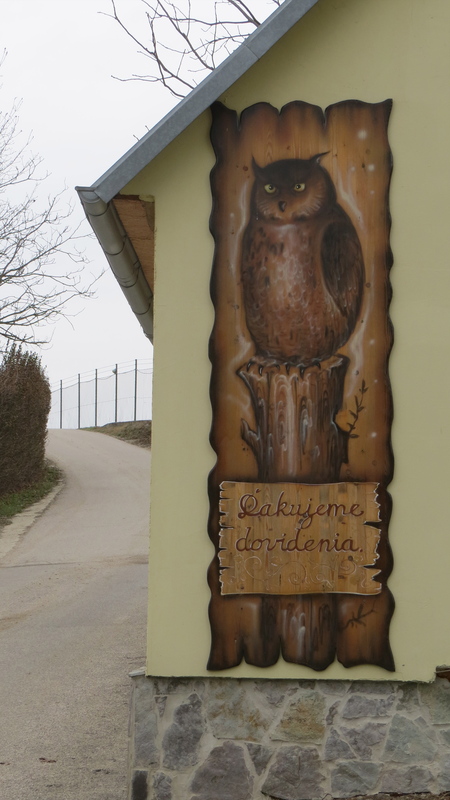 In Slovakia it is the ultimate epitome of a return to rural roots. And therefore a return to traditional, fresh Slovak food. One thing. Whilst I wasn’t really expecting (just hoping, somehow) for the Deliverance soundtrack that might have been most appropriate on the stereo, the tame R&B playing for most of our visit did slightly undermine the atmosphere. Music is important. If the guys in charge of Reštaurácia Furman realised that, this place would be truly exceptional. MAP LINK: Top of the screen is Piešt’any, with spa island in the middle of the river there; mid-right to the right of the reservoir is the restaurant. Getting to the restaurant by road, it’s just a couple of km from the other side of the River Váh from the town centre. BEST TIME TO VISIT: A winter lunchtime after a walk. NEXT ON THE JOURNEY: 2km northwest you can relax with treatments in the best of Piešt’any’s spas whilst a 20km drive or walk (through the hills) north brings you to Tematín Castle. The Fujara – and Where to Experience It! Nothing represents traditional Slovak culture quite so poignantly as the fujara. This huge three-holed flute has its origins in the nation’s shepherding past, when shepherds would project resonant, melancholic tones out over the valleys in which they tended their flocks as part of a system of communication between isolated farmsteads. Later, the instrument became used more just for entertainment at special occasions, or a solemn tribute at sadder moments. The fujara is traditionally made from elderberry wood – an easily malleable material with incredible acoustic properties – and intricately decorated in motifs gleaning their inspiration from the natural world in which countryside-dwelling Slovaks lived. It is extremely difficult to make, and not much less tough to play. Whilst bryndza, the tart sheep cheese at the heart of so much traditional Slovak food, still props up many restaurant menus nationwide, the sheep in Slovakia today, and the practice of sheep farming, are both much less in evidence. The Communist-era društvo (large-scale farm) has been cited as one of the causes. But the fujara remains as a hallmark of times passed. Its strangely haunting melody ricochets around the mountains of Malá Fatra, Vel’ka Fatra and Central Slovakia – where the instrument was first developed – to this day. Now it’s mostly played at folk festivals – such as the national fujara players’ meeting every September in the beautiful Malá Fatra community of Čičmany, a village worth visiting in its own right for its prettily-painted log houses. Its past – and its role in that past – is why Unesco added it onto their list of intangible cultural heritage in 2005. It had been a long time in coming. Circumstances had thwarted us from visiting Traja Mušketieri, Bratislava’s medieval-themed Slovak restaurant, on many an occasion. Now we were to be thwarted no more… although its location, on one of the elegant old back streets behind the Presidential palace, can be hard to find. As you descend into the vaulted interior to be greeted by courteous waitresses clad in medieval garb you might be forgiven for thinking of the anachronism: the traja mušketieri (aka three musketeers, of course) were 17th century, right, not medieval? OK – so let’s call the theme here “century-old” or “swashbuckling days of yore” perhaps. As you pull up a pew at one of the heavy-set banquet tables inside, though, you’ll soon start to focus your attention on the food itself. Or let your eyes wander over the swords mounted on the walls, the old tapestries, the very fetching (but definitely medieval-looking) tankards… the cosy old-world charm, in short. And the service – which is anything but medieval. It’s actually one of the things that make the place. These staff are – by Slovakia’s “on a learning curve” standards and by English standards too, which certainly fall in the lower echelons of European table service – profession, polite, friendly and competent. They know the menu, they know which meals to recommend for dietary requirements, they know which wines to recommend for which dishes, they’ll speak English too. Onto the food. Pretty expensive by the city’s standards but if my bank balance permits I have no problem with paying for the extra quality. 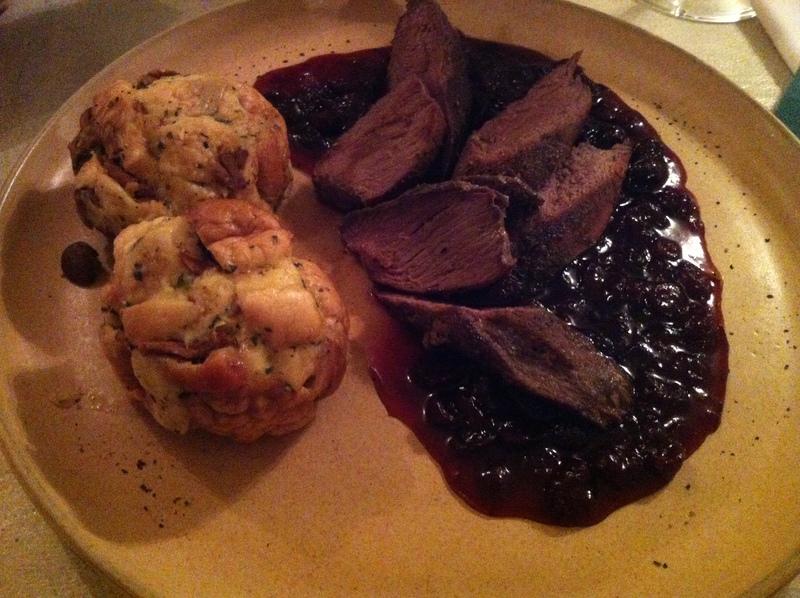 I went for a deer in cranberry sauce with chantarelle buns; my dining companion for a thick juicy fillet of steak with those delicious soft-roasted rosemary potatoes Slovakia does so well. The food was really good – those chantarelle buns particularly were divinely fluffy. And for a starter, Traja Mušketieri’s pate is justifiably renowned. 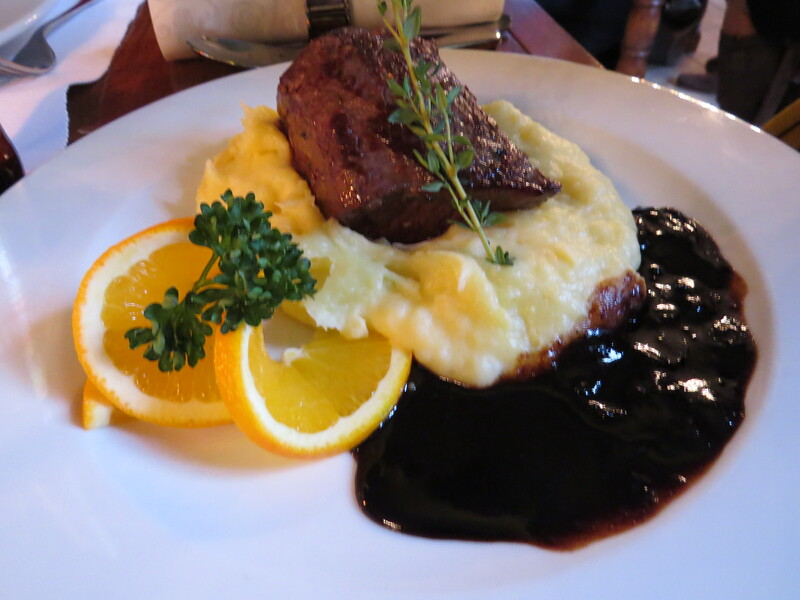 What I liked best is that this restaurant is happy to offer Slovak classics with a touch of classy creativity, rather than compromise and have a menu peppered by, say, French dishes which is a trend in many good Bratislava restaurants. 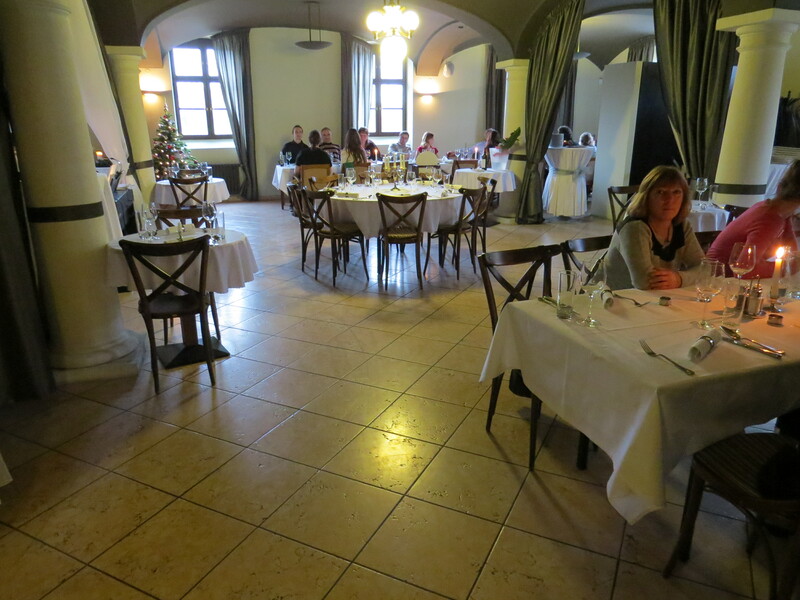 It was, overall, a really good eating-out experience in Bratislava. What I would say, though, is that I do not understand why you have to pay prices that would not look amiss in a central London restaurant (12-20 Euros for mains) to get good food and courteous service. Because when you start paying much below that in Bratislava (the average main meal cost in the city is probably 5-8 Euros) one of those two essential tests of quality start slipping a little when you’re talking about evening meals. So well done Traja Mušketieri for getting it right, and here’s to hoping more will follow the high standards. OPENING: 11am-10pm Tuesday to Saturday. BEST TIME TO VISIT: Mid-evening, around 8-9pm. Štrbské Pleso is a place people end up at. Its beauty is much touted in Slovakia (and it even makes a point of stating, on the banks of this lake ensconced beneath the High Tatras peaks, about how it got on the long list for the Seven Wonders of Nature). To be honest, such a bid was a bit of a long shot. For a start, a Wonder of Nature probably shouldn’t have hotels along two of its shores. It’s a very pretty place, however. And the chances are you’ll come here on your High Tatras sojourn because it’s a great base (those hotels, remember) for some truly amazing hiking (the lake is right on the country’s most-famed hiking trail, the Tatranská Magistrala), skiing and mountain climbing – not to mention being the end of the line of the Tatras Electric Railway (and “end of the line” stations always hold a certain fascination). We’ve created a separate post on Štrbské Pleso which covers the attractions of this mountain lake and the village below it (which makes the Wikipedia entry look, dare it be said, scant). 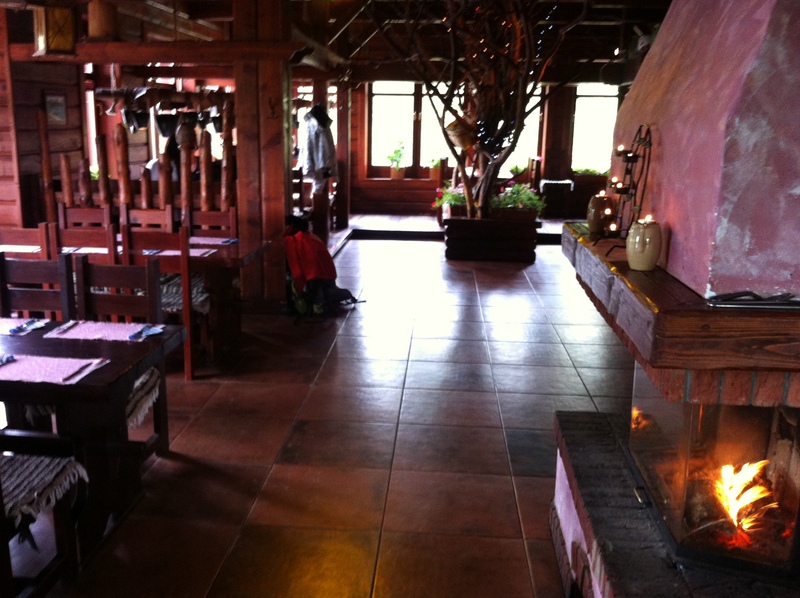 But for this post we want to focus on Koliba Patria, a fairytale-like chata (i.e., mountain cottage) restaurant on the eastern shore of the lake. It doubles up as being the most beautiful building in the area and serving the best food. As you hit the southeast corner of the lakeshore on the main path up from the mountain railway station and the village “centre”, head anti-clockwise on the lakeside path and, half way around to Hotel Patria (who own the joint) you’ll not fail to spot the place. The inside (nice and light with lots of windows and a balcony looking out on the lake) is utterly traditional Slovak: everything done in dark wood with a huge ceramic stove typical of rural Slovakia, ski apparatus and other old farming implements on the walls, along with several pictures of the Tatras back in the days of yore. Seating is in a series of alcoves (separated by screens and making the eating experience quite private) and there’s an upstairs too generally only open for functions. Service is very good here, and they’re used to all kinds of bizarre tourist requests. But it’s certainly not just a spot for foreign tourists: it’s mostly Slovaks on a weekend day out lunching here. You’ll find it easy to read the menus (options are in German and English besides Slovak) but not quite so easy to choose. But whilst the menu is fairly international, the Slovak classics are the thing to go for here. There’s a good intro to the Slovak sheep’s cheese known as bryndza (a tasting platter of the stuff) – or you can go for a deliciously creamy version of the national dish, bryndzové halušky (sheep’s cheese dumplings with bacon). In fact, sheep’s cheese has rarely been glimpsed in a restaurant in as many combinations – you can even (unusually for Slovakia) order it with just a salad (apples and tomatoes). The Slovak mains also have the advantage of being quite cheap (5 to 8 Euros). On the meat front, the deer with plums and Slovakia’s delicious herb-infused way of preparing roast potatoes goes down very nicely… and, if you dare, you may wish to try Slovakia’s deadliest drink, Tatranský Čai or “Tatras Tea” – a potent locally-brewed spirit with a taste like Jagermeister. So there we have it: caught between the at-times pretentious glamour of the Grandhotel Kempinski on one side and the ostentatious bulk of Hotel Patria on the opposing shore, Koliba Patria is, quite simply, a nice and very welcoming place to stop, eat and get acquainted with Slovak cuisine in a serene surrounding. Gone, thank God, is the village centre bustle and the terrible souvenir shops. The hikes, the hotels and the beckoning ski resort have managed to absorb the crowds and left this spot relatively relaxed. BEST TIME TO VISIT: Around 12:30pm for an early lunch, when it’s none too crowded and it’s still perfectly acceptable to begin it all with some of the delectables cakes and coffee. As it’s on the lake shore, be sure to come here when it’s still light so you can see something of the view. A picture, you see, is often worth a thousand words – or more. Who wouldn’t want to stay here, on the banks of Zelené Pleso, with this sensational view of jagged mountains rearing up above you, scarred with waterfalls and part-coated in snow? I turned up here not knowing anything about the place, as I was starting off on the Tatranská Magistrala hike which runs from one side of the High Tatras mountains to the other. Chata Pri Zelenom Plese is only a 45-minute hike (heading up to the start point) or 30-minute hike (heading down) shy of the official start point of the walk, Vel’ké Biele Pleso (see more details on the first stage of the Tatranská Magistrala from Ždiar to Chata Pri Zelenom Plese). This Chata is not by any means the most famous of the High Tatras Mountain houses (that would probably be Zamkovského Chata or Teryho Chata). But it’s my favourite, and I’ve stayed in/visited a few. Being unknown, whether you’re a weary hiker, a cross-country skier or climber (no more explanation of these last two activities need be given than the pictures above and below) or just someone who likes staying in formidable wilderness, you’re going to be pleasantly surprised by this place, the English translation of which is “House on the Green Lake.” The only way in is to hike or bike, unless you’ve got a fairly resilient 4 x 4. A long bumpy track of about 8/9km winds up from just south of the hamlet of Kežmarské Žl’aby on the 537 Highway northeast of Tatranská Lomnica, the easternmost of the High Tatras resort villages (see the end of this entry for directions here). There’s an established mountain biking circuit heading up too. Being way off the most hiked sections of the High Tatras to the west, Chata Pri Zelenom Plese has something of a remote feel, but once you’re ensconced in the restaurant and you’re tucking into the decent range of very well-cooked meals (they cook better than Zamkovského Chata) you’ll feel, with the dizzying view of the high peaks through the restaurant window, very cosy and – given there’s skiers to watch and waterfalls to gawk at, very well entertained. For the accommodation, there are two options: a “hikers room” for a mere 8 Euros per person, with just mattresses, where you’ll need your own sleeping bag, or slightly more expensive digs in private rooms with bunk beds. It’s basic, but in a clean and friendly way. Showers are down in the basement: a slight disadvantage but hey, you’re an outdoor lover, right? This is warm, simple accommodation and anyway – you’ll be spending most of your evening in the restaurant with beer and that view we mentioned. Slippers to wear (as per Slovak custom) and towels are available for free. The evening meals (set dinner 8.80 Euros or you can order meals individually) and breakfast (buffet 5.50 Euros) are of high quality. Bryndové pirohy (see our Top Ten Slovak Foods & Drinks for more on this classic national dish) makes for a divine main and follow it up with the not-to-miss poppy seed and cherry strudel. For when the weather’s not too wild, you can sit on the lakeside terrace and stare out at the ever-changing colour of water (a kind of algae gives the water that surreal green-blue colour). 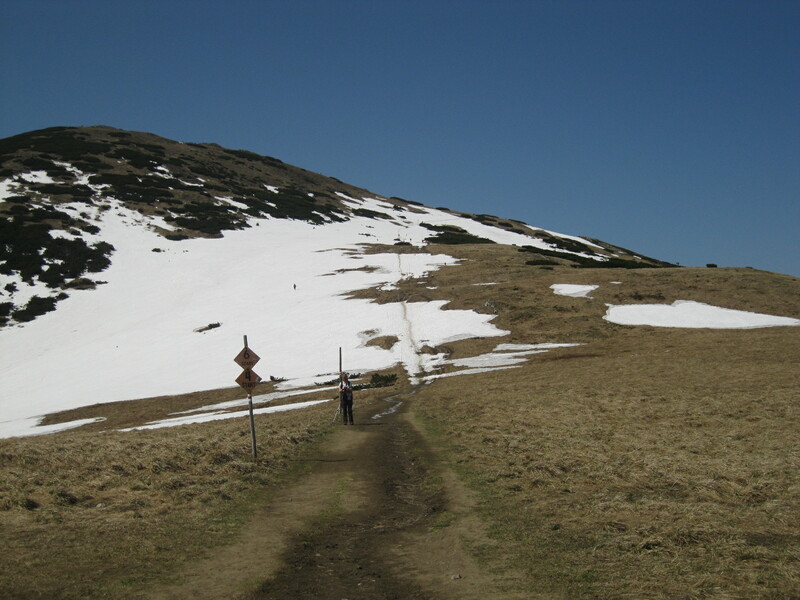 If the snow’s not too deep, you can also follow the path anti-clockwise around the lake and up to the first of the waterfalls, but the ascent beyond here this way is for professionals only. If you’re here for the hiking, there are red and yellow trails to follow from here. Red is the Tatranská Magistrala Stage 2 and heading west is a very tough hike (read that last blog entry for a warning) whilst yellow takes you up to Skalnaté Pleso and on to the centre of the High Tatras via an easier route (see the same blog entry for this route description too). Road access is northeast of Tatranská Lomnica just southwest of the hamlet of Kežmarské Žl’aby (drivers: Google maps reveal all). See our Tatras Electric Railway post on how to get from Poprad (on the main train line to Bratislava) to mountain resort villages Starý Smokovec and Tatranská Lomnica. From Tatranská Lomnica take a bus a few minutes to Stará Lesná from where there are hourly buses throughout the day to Kežmarské Žl’aby; there are some additional buses direct from Starý Smokovec. Ask the driver to be dropped at the beginning of the Chata Pri Zelenom Plese access track. BOOK CHATA PRI ZELENOM PLESE Please note that this is an extremely remote mountain house; as per the left-hand menu on the website, booking is best through the email tatry@chataprizelenomplese.sk (where you’ll stand the best chance of a reply in English) or, if you’ve only a little time before your stay, telephone (00421) (0)901 767 420. I was in Ružinov for a work meeting. I was quite excited. This was not because I was expecting anything particularly amazing from this large neighbourhood of Bratislava, the southeastern extension of Nové Mesto (New Town) just east of the city centre’s Staré Mesto (on this site we generally refer to it as the Old Town). It was because I am always excited by new things, and this was Englishmaninslovakia’s first chance to really scout out the area. But I’m not going to wax lyrical about Ružinov because Englishmaninslovakia neither likes to deceive nor indeed tempt travellers away unnecessarily from a city centre which is far more charming. However it does contain two exceptional attributes, and one of them was right in the building I happened to be visiting, at Doktora Vladimira. Clementisa 10: namely the exceptional cafeteria of Apores. What I whimsically call Communist-style cafeterias are still, 21 years on, an important part of Slovak eating culture. Picture a canteen, perhaps like one where you once had school dinners. Picture fixed formica tables, and cheap set-price lunches, and invariably surly old women ladling something unidentifiable and colourless out of a vat, and, perhaps most intense of all, water that comes with different colourings, including a garish pink. These canteens or cafeterias are perhaps not so prevalent as they once were, but they are still ubiquitous and still, I would argue – for better or for worse – an interesting cultural phenomenon for the outsider to behold. But what is almost always true about them is that the food is, well, school canteen style food. It’s not renowned for its presentation or succulent taste. But this cafeteria was clearly cut from a different cloth. Perhaps you could even say it was a sign of how, slowly, Ružinov itself is changing. There were four gluten-free options, including delicious roasted veg, for which I opted. There were tasty soups. There was serendipitous, really decent espresso, which always cheers me up. 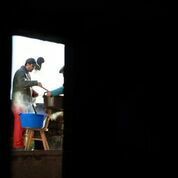 There was a view onto the nearby park (so none of those starkly strip-lit canteen images that probably come to mind). 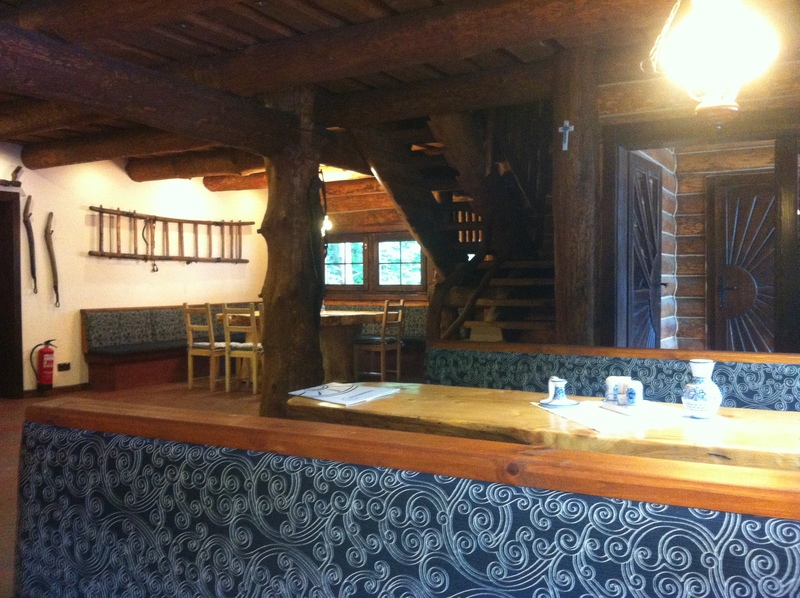 Apores was a traditional Slovak cafeteria with a touch of city sophistication. For now, however, rest easy: a good cafe serving strong espresso will hardly get tourists flocking. Nor, indeed, will one of the city’s main cemeteries, Ružinov’s Martinský Cintorín. 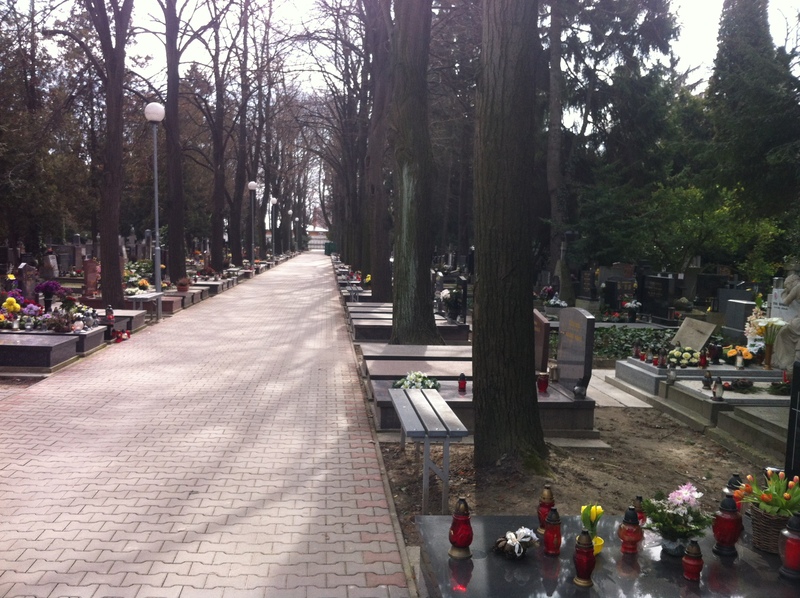 I checked it out afterwards: a leafy spot where a few famous people in Slovakia are buried (Jozef Budský, for example, a Czech actor who helped to raise the standard of professional theatre in Slovakia no end). Nor, quite probably, will the nearby presence of Miletičova, the city’s largest fresh produce market (best day is Saturday; for an excellent post on the market visit this blog). 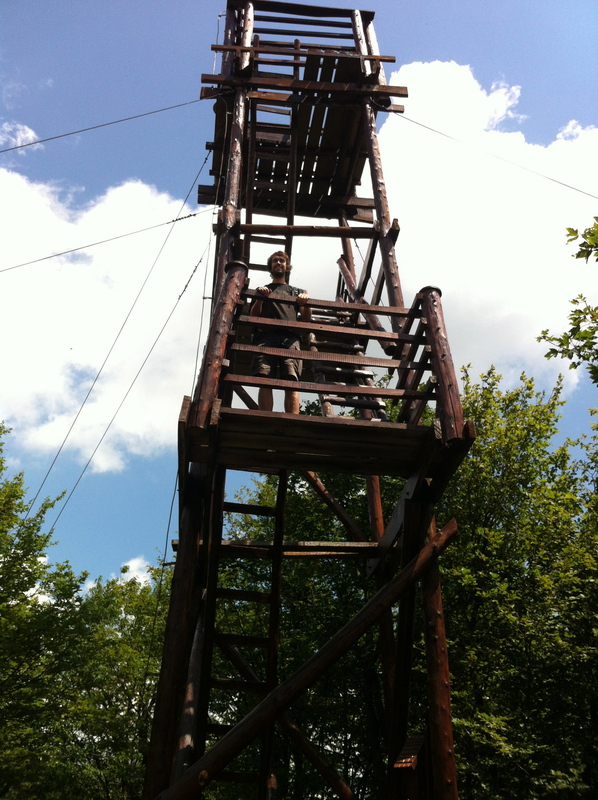 But should work take you out to the Ružinov area, it’s not quite the industrial wasteland it first seems. GETTING THERE: Tram 8 or 9 from Trnavské Mýto will take you there – see our list of key Bratislava transport routes for more. I remember laughing the first time I heard that Bratislava’s Christmas Market, that started on 23rd November and runs until 23rd December, was one of Central Europe’s best winter festivals. With Vienna’s famous Christmas markets less than an hour’s drive away, could Bratislava’s really be considered in the same league? Well, maybe not. But when we joined the hoards to experience it for my very first time (since then, there have been many more) I could see why people would rave about Bratislava’s festive food and handicrafts extravaganzas. It really seems that Bratislava comes alive at Christmas. It isn’t a big city, after all, and quite often you’ll be walking through central Old Town streets like Kostolná Ulica behind the Old Town Hall, and not see another soul around as early as 9pm. But at Christmas, the people, wherever they have been hiding, emerge. Possibly they are also coming from other parts of Slovakia and even other countries, because I have rarely seen Hlavné Námestie so packed, or so animated, despite the sub-zero temperatures. And all because of the Christmas market: which, although you would not think to look at it, was never a traditional event in the Bratislava of olden times. Within an endearing, typically Central European encampment of red-, green- and blue-painted wooden hut-stalls you have the perimeter of handicrafts offerings, and then in the central section the smouldering aromas issuing from the food stalls: it really was like a showcase of classic Slovakia laid out for the taking, with the illuminated Baroque buildings of Hlavné Námestie framing the scene. You could tell very soon what the most popular section was. The craft stalls, which I actually preferred, were relatively easy to browse unobstructed. But the food stalls were jostling with so many potential customers it was hard to even get close to place your order to the vendor. But it was worth the fight through the throngs: stalls were selling the likes of delectable medovina (mead), piping hot spiced but not overly sweetened wine, lokše (delicious Slovak potato pancakes, which come with fillings such as the famed Slovakian sheep’s cheese, bryndza, or sauerkraut, or perhaps duck fat paste), various assorted sausages like the traditional Czechoslovakian blood sausage called jaternice, and the pork liver burgers called cigánska pečienka. 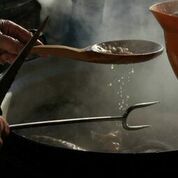 A tip when you’re scouting for the best lokše: almost every food stall sells it, so choose carefully, because some stalls sell them when they are nigh-on bone dry. Go for a moist-looking one, and have it with the duck fat for the ultimate Slovak experience. Somehow despite the cold a musician was churning out some typical Slovak ballads on an accordion and a stage was set for some classical music performances over the weekend (although even the most appreciative audience would surely freeze if standing there without moving for any length of time). Amongst the crafts, my favourite by far were the wonderful šúpolienky (expressive figures made from corn husks with innocent, simple features, fashioned into animals, nativity scenes or men and women doing traditional work such as collecting wood or baking vánočka (vánočka, incidentally, is another Christmas treat – heralding from the Slovak word for Christmas, vianoce – a sweet, wonderfully light bread-cake with dried fruit like currents and spices within). I also loved the room scenters – dried clove-scented fruits like pumpkins cut into small pieces and arranged artistically like hanging mobiles. And the fun was also spreading down to my favourite Bratislava square (námestie), Hviezdoslavovo (although it’s far from my favourite to pronounce). Here a huge Christmas tree illuminated some more food and craft stalls, complementing the bright lights already twinkling from one of the city’s most beautiful buildings, the Slovak National Theatre. 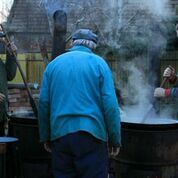 Men in merely shirt-sleeves (it was below freezing, remember) were carving up roasted pork, old women pottered around selling products they had knitted, that piping hot spiced wine flowed and I felt well and truly christmassy. Bratislava’s Christmas market is on every day from 10am to 10pm, until 23rd December. 24th December, of course, is when Christmas Day is celebrated in Slovakia, so that’s why 23rd December is the last day. On December 6th every year, every single Slovak opens presents from St Nick. A misprint? Think I’m 19 days ahead of schedule? Uh-uh. Slovakia, along with several other countries in Central Europe, celebrates Mikuláš (aka St Nicholas) Day in a far more poignant way than I was used to in England (where it gets but a cursory treatment). My ex-girlfriend (K hereon in to save on characters) used to instruct me the night before to clean my shoes (ideally a large pair) and put them in the window to see what St Nicholas would bring to place in them. Mikulás, undeterred by the space he had to stuff the presents, managed to get, unobserved by all, no fewer than two massive sacks filled to the brim with almost every imaginable Communist sweet and chocolate! It became a thing. Mikulás Day=time for retro Slovak sweets. Some Slovaks might receive bigger presents but I was quite content getting chocs! Upon closer inspection, it appears everywhere from the Ukraine to Germany to parts of France to various German-influenced cities in the US like Cincinatti celebrate St Mikulás/Nicholas Day with presents in the shoes. The English are missing out: this has to be a candidate for the first Slovak tradition I’m introducing to England! Traditionally, however, Mikulás does not appear alone in Slovak homes but with an angel and/or a devil, no less. The angel would appear to bring children small (often sweet-themed) presents to reward them for good behaviour over the last year and encourage them to continue being good over the next one. But, had they been bad (or if they had not cleaned the shoes they left out for Mikulás) then the devil would come to fill their shoes with coal. I guess I have to date always been able to do just enough to avoid getting the coal: we’ll see what next year holds in store! Anyway, I invariably spent Mikulás Day very enjoyably munching Slovakian sweets and chocolates. My favourite thus far? 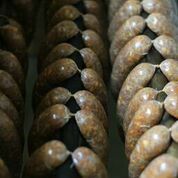 Sójové rezy: a surprisingly delicious sweet but one that looks quite unappetising when you unwrap it (a heavy, colourless, dumpling-like roll). Put it in your mouth, however, and the heavy soya-based Sójové rezy takes on the taste of what I can only describe as that of Baileys! Yet another example of a Slovak food that, whilst not looking that appealing, tastes pretty damned perfect.